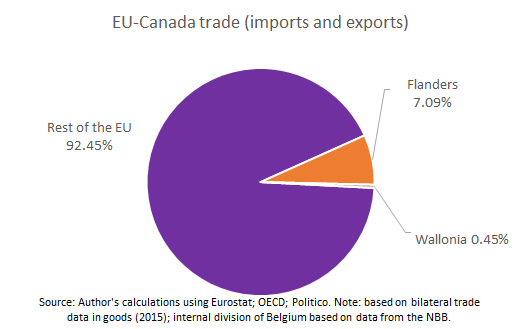 The figure of Wallonia’s trade relations with Canada, compared to the rest of the EU, are astonishingly low with an overall figure of 0.45 percent. Note that I have been generous here with my back-of-the-envelope calculations. In 2015, Wallonia seems to export more than it imports with Canada with a figure of almost 9.5 percent of total bilateral trade between Belgium and Canada. 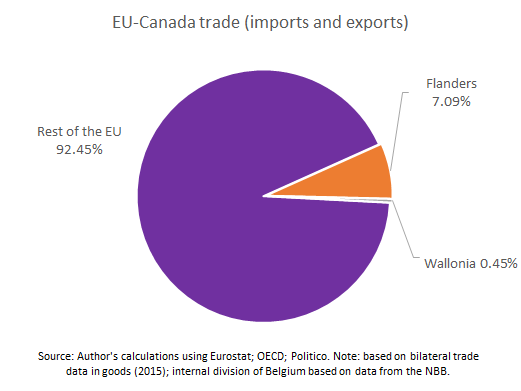 However, Wallonia barely imports anything from Canada, a low 1.37 percent of total bilateral trade between Belgium and Canada. Now, a couple solutions to this puzzle might help explain Wallonia’s opposition. One, import-competing sectors are extremely powerful in this region. Second, Antwerp is in Flanders, not in Wallonia. Third, Wallonia’s current Minister-President has another agenda for which he likes to use CETA. As you're not (as far as I can see?) on Twitter, you might not have seen the conversation (in English and Flemish, mainly) sparked by your pie chart, which I saw via Borderlex and Tweeted Friday evening. I won't include links to the Tweets here, as it might put this comment in your spam queue, but here's one good question from Michel Rose of Reuters: "Surely that statistics reflects the fact Wallonia has no large trading port and has to send goods via Flanders... I wouldn't be surprised if Wallonia's glass/aviation parts exports went through Antwerp, distorting data"
Thanks for getting back to me. I think this is partly true, and that was also my immediate reaction to these numbers. But things are a bit more complicated than that. First, I took figures at National level at the NBB which excludes Antwerp's entrepot activities of imports and re-exports. So even without this type of trade the figure for Wallonia is extremely low. Second, it could well be that much of Wallonia's imports are going through Antwerp first and then to Wallonia, but then it may be a recording issue of trade. Now, imports and exports are to my knowledge measured at the firm-level for really who imports the goods, in Wallonia, not in Antwerp. They might arrive there first, but it's unlikely that surveys are picking this up as if Antwerp is importing. Third, the recent economic trade literature has also shown us that big firms are holding a disproportionate share of trade in most countries. These are mostly present in big cities, which Flanders has more than Wallonia. Brussel is separate, but I added it nonetheless to Wallonia in the figure I presented. So, I guess, many large firms active in the surroundings of Brussels which are actually in Flanders are responsible for Flanders extremely high trade share, together with Antwerp of course, which in fact dwarfs Wallonia's share. Moreover, I am curious to find out Wallonia's detailed sectoral activities. I suspect it still does a lot in primary sectors in which it trades a lot less or has a lot of activities in the non-tradable sector. To be wholly precise, there is a staristical issue here in the sense that I suspect that EU trade figures on which Flanders and Walloon trade might not be cleaned out for re-exports. In that sense it could be an unfair refence point. Yet, the 1.38 percent of imports from Wallonia is a clean number and is just extremely low. Now, usually import-competing industries are the ones who are usually holding back further liberalization of trade, especially regarding tariff on which so much of CETA is precisely negotiayed. So, my queation then is: are these import-competing industries so powerful in there lobby efforts to hold back further foreign competition? Could be, but I suspect really now. That would be too extreem. Though I think most resistance targetted for further trade liberalization in Wallonia would come from the agricultural sector, a sector traditionaly not very much aligned with the socialist party however.